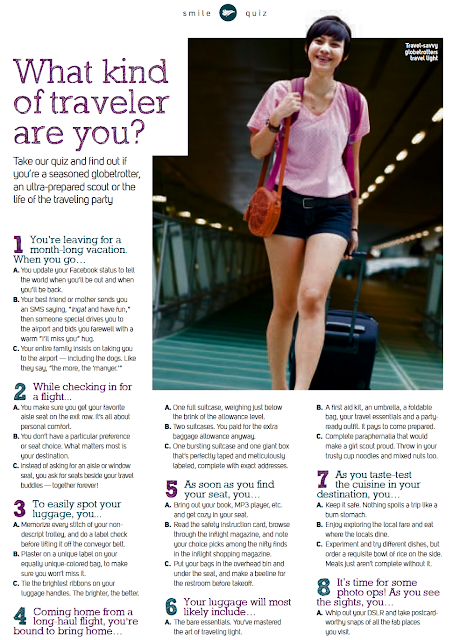 There's this short quiz I've read from Smile, Cebu Pacific's inflight magazine, and it tries to classify which type of traveler a person is. According to many articles, to enjoy any trip with a buddy or a group, you must be familiar with them and how they want to spend their time in another place. Chances are, if your travel buddy isn't in harmony with your travel quirks, there's a big tendency that you both would fight over some details on your trip. To solve such differences, there must be adjustments on your travel itinerary which would cater to what you both, or what the group members, want. Well, another option is to find a travel buddy who shares the same liking as you, in'nit? This would be better instead of making adjustments to a wonderfully made itinerary. So here's the short quiz I saw from Smile.